How Do You Know It’s Authentic Native American Indian Jewelry? Home / Authenticity / How Do You Know It’s Authentic Native American Indian Jewelry? 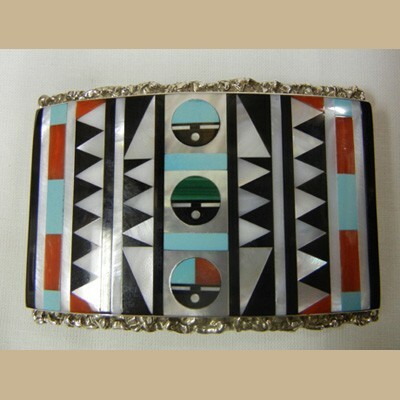 Authentic Native American Indian jewelry is as much a fashion statement as a piece of art. The right piece can accent your facial features and attire or show how current you are to trends in the fashion world. Native American Indian jewelry also connects you to a rich artistic tradition among Pueblo and Native cultures…if it’s authentic. Jewelry-making has been part of the artistic tradition of many Pueblos and Nations for over a century. The Spanish first introduced silversmithing to Navajo and other Native American Indian people in the Southwest. Since then, the Pueblos and Tribes have developed their own unique styles and perfected techniques that they pass down from generation to generation. Jewelry created using these time-honored techniques are, indeed, art. Artists create one-of-a-kind pieces using hand tools and techniques that rely on imagination, skill and patience rather than a machine. Sand casting or tufa casting, for instance, requires that a silversmith first carve the mold for silver from materials that will be destroyed when the molten silver is poured. 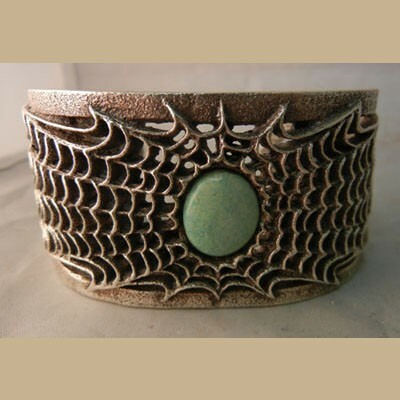 Yet the detail of the designs like this tufa cast bracelet (left) by Santo Domingo silversmith Gilbert “Dino” Garcia, hints at the amount of time and skill required to create the mold. Similarly, the intricacy of patterns and size of stones in many inlay pieces, most notably by Zuni artists (right), illustrate the artist’s attention to detail. More impressive is that Native American Indian artists do not use adhesives to set their stones, but wedge them into their settings or inlay patterns with sand and other materials. Each piece of Native American Indian jewelry is unique and the result of hours of intensive labor and great skill. A fair price should reflect that. So, the first telltale sign of authenticity is price. If you’re getting “bargain” jewelry, you are probably not getting authentic hand-made Native American Indian jewelry. Federal law does provide some consumer protections for those seeking to purchase authentic Native American Indian art. The Indian Arts and Crafts Act of 1990 mandates that the terms “Native American” and “Indian” can only be used to label a product created by a member of a state- or federally-recognized tribe or nation. Beware of labels like “Indian-style”, which indicate pieces that look like Native American Indian jewelry but are made elsewhere (i.e., replicated abroad). In addition to price and labeling, there are some signs to help buyers distinguish authentic from fake Native American Indian jewelry. The presence of a hallmark, a silversmith’s signature, or both, indicates an authentic piece. However, not all artists “sign” their work, so the absence of a hallmark cannot be taken as an authoritative test of authenticity. Other signs of authenticity include the quality of materials used in the piece. Native American Indian artists pride themselves on their work and often use the highest quality materials. Hence, authentic Native American Indian jewelry will most commonly be sterling silver. An easy way to determine a sterling piece from a silver-plated piece is to use a small magnet. Sterling silver is not magnetized, so the magnet will not pull the piece. The base of silver-plated pieces, however, usually contains nickel, which will respond to the magnet. Unfortunately, determining authenticity of Native American Indian jewelry is more challenging than determining the authenticity of Native American Indian pottery. Artists are so skilled that they leave little visible evidence of their techniques and manual work. For instance, hand-stamped silver pieces may not have the precise symmetry as a machine-stamped piece, but the deviation may not be perceptible by the untrained eye. Similarly, while a jeweler may be able to tell if stones were set using adhesive, the average buyer cannot. The best safeguard a buyer has against purchasing mislabeled or fake Native American Indian jewelry is to purchase pieces from a reputable trader. An experienced trader will be able to answer questions about the piece, the artist, the Pueblo or Nation’s jewelry-making traditions and characteristics. Palms Trading Company has been buying and selling Native American Indian jewelry for 80 years. Our knowledgeable staff has developed personal relationships with many of the silversmiths and jewelry artists whose work we carry. We recognize many hallmarks, characteristic work of individual artists (like Joseph Coriz’ use of 14k gold in his overlay pieces) and Pueblos or Nations (like the cornstalk on Hopi jewelry). As a member of the Indian Arts and Crafts Association, we guarantee that all Native American Indian jewelry we carry is authentic, unless otherwise specified.